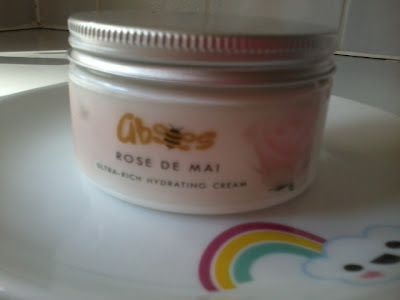 Skinsmatter sent me Abees Rose De Mai Ultra Rich Hydrating Cream which was shortlisted for the FreeFrom Skincare Awards 2012. You may remember I blogged about the winners click here. Abees is not a brand I am familiar with so I looked up the website. Their products are natural and free from “harsh chemicals”. Abees only refer to "SLS, parabens, petrochemicals etc." I prefer companies to list the ingredients that they have left out as not everyone has the same opinion about "harsh chemicals". Next to some products it states “not tested on animals” so do I assume this is across the entire range? It would be strange if it was not the case. Obviously from the name you can guess that the products contain honey so will not be suitable to Vegans. I really wish the website “About” page was more informative. I have written about lots of products and normally I can tell you where they are made, who makes them or industry accreditations but here I am clueless. Purified Water (Aqua), Extra Virgin Olive Oil (Olea europaea), Sunflower Seed Oil (Helianthus annus), Virgin Coconut Oil (Cocos nucifera) Cetearyl Alcohol (Vegetable based), Emulsifying Wax (Vegetable based), Rose de Mai Essential Oil ( Rosa centifolia) , Rose Geranium Essential oil (Pelargonium graveolens), Patchouli Essential Oil (Pogostemon cablin), Vegetable Glycerine, Citric Acid, Phenoxyethanol. On a side note Phenoxyethanol is turning up in cosmetics as a preservative alternative to parabens. Many of the products I review contain this ingredient. Some online articles argue that it is a toxic ingredient whereas others say it is perfectly safe. It has been linked to contact dermatitis and worsening of eczema so I will let you be the judge. I have to say I have not experience problems but always opt for products where Phenoxyethanol comes at the end of the ingredients list as levels should be low. Many argue that preservatives are necessary because bacteria and mould are far worse. At the end of this review I will link some further reading on this topic. Now back to the cream. 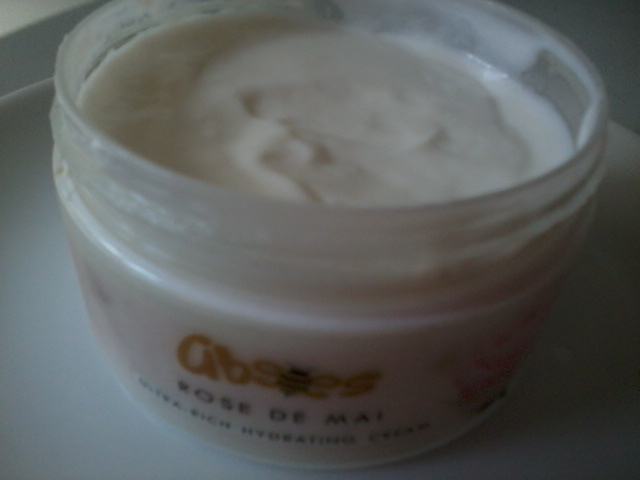 If you are a lover of Rose scent then this cream will be to your liking. I have to be truthful, my review comes from first impressions after testing on my arm. Unfortunately, the fragrance is not for me. It is not offensive but is strong and is not a scent I am drawn to. I see on the website that other fragrances are available – Apricot & Honey, Neroli & Lavender, Sweet Orange & Grapefruit. This has a nice medium to thick consistency which I would expect from a cream marketed as hydrating. It disappears quickly to leave a soft and silky feeling. Overall, the cream is of nice quality and it's ingredients are natural. I would recommend people give it a try. Abees product range is not large. As well as the hydrating creams you can also purchase body washes and body scrubs. This product was put forward for the FreeFrom Skincare awards yet there is no prominent marketing on the website about their free from credentials. This could possibly be loosing them business to people like myself with eczema, allergies and a passion for natural skincare. It is not just the website letting Abees down there are no logos on the jar promoting to the consumer that products are SLS and paraben free. It may seem as if I am nit picking but I think the Company has a lot to offer and they are under selling themselves.